Although this may well have been Kenneth Ruffin’s only name 45 he did a lot behind the scenes for Joe Evans’ Carnival label writing for other acts like the Symphonies and the Turner Brothers, as well as producing The Three Reasons. But while Carnival is best known for group sounds like these and the great Manhattans I’ll Keep Holding On comes from a different style altogether. In front of his own piano licks and a powerful horn section Kenneth gets into a much heavier bag, pouring out his emotions especially in the fine run out groove. The pounding uptempo flip is pretty good too – great baritone sax. 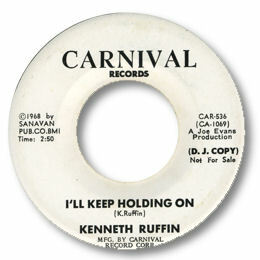 Note ~ “I’ll Keep Holding On” is on Volume 1of the 3 volume set of Carnival recordings issued by Ace UK “Wishes” (CDKEND 108) and “Cry cry cry” is on volume 3 “I Wanna Be” (CDKEND 124).